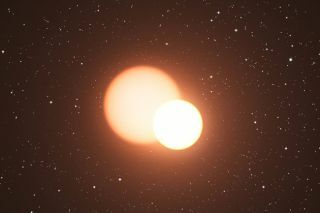 Artist's impression of the eclipsing binary system, including a pulsating star called a Cepheid variable. Since the 1960s, a class of specialpulsating stars hasstymied scientists attempting to weigh them. The two main ideas for howto measurethese stars' masses have so far produced vastly different results. Now astronomers report the discoveryof a peculiar star systemthat may provide a Rosetta stone of sorts, allowing researchers tofinallydetermine which method of weighing the stars is accurate. These pulsating stars, called Cepheidvariables, hold aplace of honor in astronomy because they allow scientists to measureintergalactic distances. Cepheids pulsate ? becoming brighterand dimmer ona steady schedule ? because their gas heats and cools, and expands andcontracts, in a cycle. For years, scientists have determined the masses of Cepheidvariables usingtwo opposing theories, with wildly different results. One method isbased onthe theory of how stars evolve over time, while the other is based onphysicalproperties of variable stars. Calculations from the first methodsuggest these stars weigh20 to 30 percent more than calculations from the second processsuggest. Untilnow, astronomers have been unable to reconcile the difference. "We have measuredthe mass of a Cepheid with an accuracy far greater than any earlierestimates,"said team leader Grzegorz Pietrzyński of theUniversity of Warsawin Poland. "Thisnew result allows usto immediately see which of the two competing theories predicting themasses ofCepheids is correct.? The team found a special Cepheidvariable star known asOGLE-LMC-CEP0227 that is rotating around a companion star in such a waythatthe two take turns passing in front of each other from Earth's point ofview. This system, known as an eclipsingbinary, is different fromstandard binary systems because of its angle toward our planet: Thestars'orbits occur in a plane along our line of sight. As one star blocks theother, thebackground star's light is obscured, and the change in brightnessallowsastronomers to learn a great deal about both stars. Such a system is incredibly rare ?the new pair of starswere discovered outside our Milky Way galaxy in a neighboring galaxy,approximately 160,000 light years away, called the LargeMagellanic Cloud. Using the EuropeanSouthern Observatory?s telescope at La Silla Observatory inChile, as wellas other telescopes, the research team determined a precise mass forthe two individualstars, as well as their sizes and orbital motions. The measurementsprovide avalue for the Cepheid star's mass with an accuracy of 1percent ? ahugeimprovement over previous methods. The new calculations support the massmeasurements producedby the stellar pulsation theory. Predictions obtained by thetheory of stellarevolution, on the other hand, differ significantly from the newfindings. Unlike the sun, Cepheidvariables brighten anddim in a predictable cycle ranging from a few days to a few months. Thewell-defined relationship between their brightness and their pulsationperiodmeans that by timing their light pulsations, astronomers can determinehowbright the stars are intrinsically. Scientists then comparethe star's intrinsicbrightness to its apparent brightness ? that is, how bright it appearsto befrom our vantage point here on Earth. Because a star will appear dimmerthefarther away we are from it, astronomers can obtain a reliablemeasurement of aCepheid star's distance from this brightness measurement. This usefulfeatureof Cepheids has earned them the nickname "standardcandles." This allows astronomersto use them to gauge thedistance between galaxies and the rate of expansion of the universe. The researchers hope thenewfound ability todetermine these stars' true masses could help make these cosmologicalmeasuringsticks even more useful. The discovery is detailedin the Nov. 25 issueof the journal Nature.